Fall is coming to a quick close. I feel like it flew by here on the East Coast. The degrees are dropping and a crispness is entering the night. 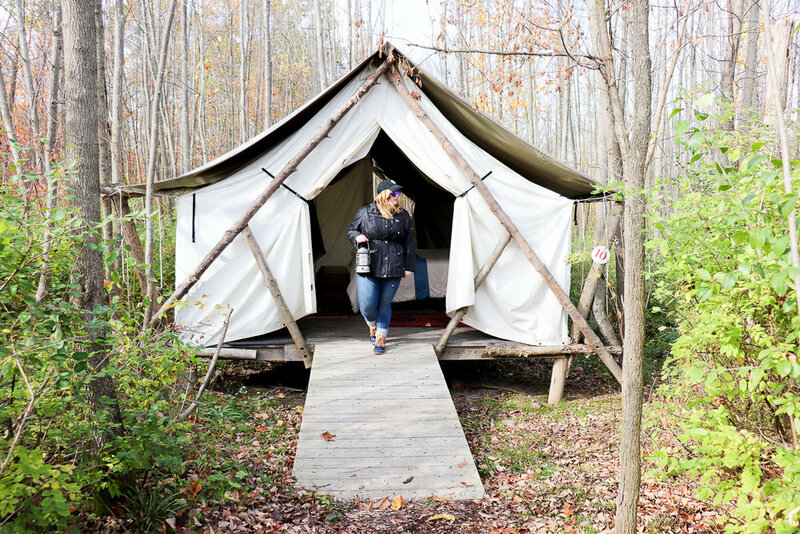 Before we get that first soft blanket of snow, I wanted to recap my stay at the beautiful, cozy Firelight Camps located in Ithaca, NY and nestled alongside the Buttermilk Falls State Park. This stay was inspired by my boyfriend's birthday at the end of October. I was fortunate to catch the final weekend Firelight Camps was open for the season and I am so happy I waited until it was cool and crisp outside. The fall colors were gorgeous and the crunchy leaves added to the ambiance. 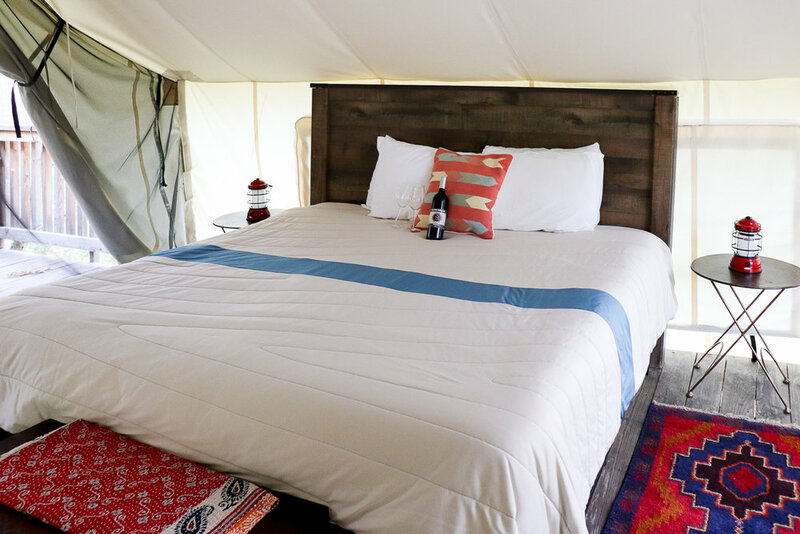 Firelight Camps identifies itself as an elevated camping experience where they "create a revitalizing, comfortable, and stylish camping experience." As a Wisconsinite, I am very familiar with camping Up North and appreciating all of the rough and dirty parts of camping; my New York native boyfriend, not quite so. I wanted to enjoy camping in the fall but I knew throwing a tent in the middle of upstate New York might be a bit daunting for a New Yorker. Enter Firelight Camps. 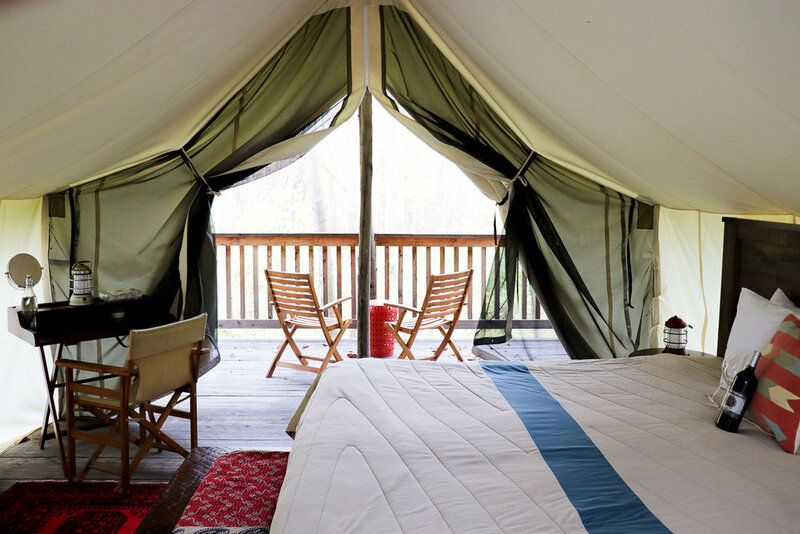 With so many luxuries tucked into the grounds of this "glamping" experience, it made it hard to remember what camping was like before Firelight Camps. Starting the tour off is our beautifully immaculate glamping tent. The high ceilings open up to a king size bed featuring Rumpl bedding for extra warmth. 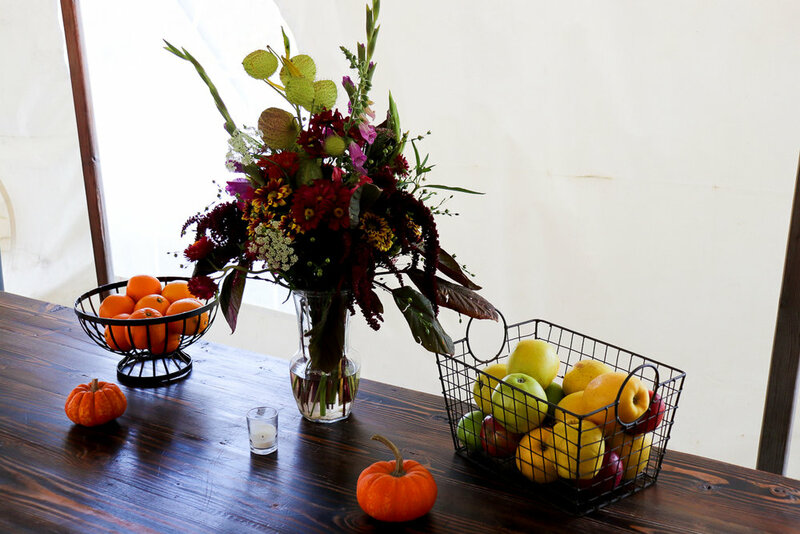 The decor is a great mix of eclectic and mid-century modern. The tones are rich and warm and you feel like you could move right in forever. The tent gives you the option of leaving the mesh open to enjoy the evening breeze or closed for enhanced privacy. Each tent is private and distanced from the other surrounding tents. My favorite part of the tents was the forest facing balcony. It allowed us to fully appreciate the complementary local wine and fall foliage all while surrounded by serenity and silence. You have the option of an electric or au natural tent for a more authentic camping experience. To add to the appeal of Firelight Camps, some tents are fido friendly! Bring your furry best friend to enjoy the nature experience as well. One of the pieces of traditional Wisconsin Northwoods camping I am not as fond of is the cleanliness. Being in the middle of the woods doesn't result in the freshest experience. However, at Firelight Camps, no detail of "glamping" was left in the dust. The bathhouse, fitted with 4 private stalls, 3 private shower rooms, and another private bathroom structure, sits atop the Firelight Camp grounds. A gleaming sense of security, you can head up to take a hot shower, grab a fresh towel, and use the provided hair dryers to freshen up before heading into Downtown Ithaca, 10 minutes away, for some sightseeing. This was possibly my favorite part of the glamping experience; a definite must have. The main lobby is a combination of a checking in section, a bar adorned with local wines and stouts, a dining hall, and a comfy lounge area. 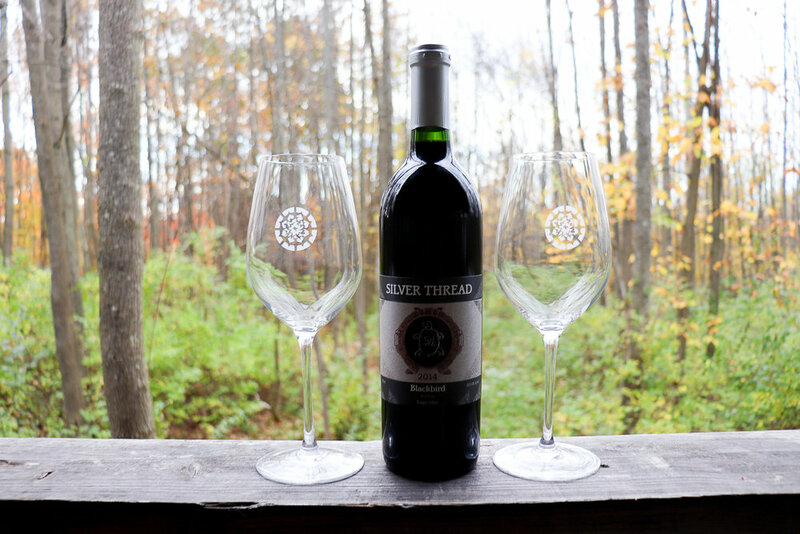 Each evening, Firelight Camps holds a wine tasting where you can sample some wonderful local wines. Settle in to the lounge area with a mug of their complementary hot apple cider (optional spiking available) while you enjoy a classic record or a board game. Firelight Camps items are available for purchase as a memento of your trip! Their fridge is adorned with individual s'mores and gourmet cheeses; a great compliment to the fabulous wine. In the morning, we enjoyed a complimentary breakfast fitted with gluten free and vegan options, coffee, and juices. I enjoyed much of my stay in the main lobby tent. One of the best pieces of camping is a crackling fire. Firelight Camps, although a glamping experience, is no exception to this toasty treat. There was comfortable seating all around the fire pit to extend the camaraderie and conversation. Grab a blanket from the main lobby tent on crisp evenings and enjoy the twinkling string lights and bright stars; something I have missed seeing since my move out East. Firelight Camps wrapped up their season on October 29th. They will be open once again in spring 2018 (stay tuned to their website for the schedule posting). Many options are available including pets friendly tents, electric tents, or double occupancy for a fun girls weekend! During your stay, you can enjoy a relaxing appointment at the August Moon Spa (a short walk from your tent), explore the Finger Lakes' famed vineyards, waterfalls and restaurants, or enjoy a fine dining evening on the grounds at John Thomas Steakhouse. A trip here will not disappoint and for every New Yorker out there, it is a comforting supplement for traditional Midwestern camping. Go check them out and book your tent for 2018! If you book, let me know how you enjoyed your stay in the comments below.